Lois's new exhibit, featuring her latest series entitled "One to One". “Resonating Fields” brings together a definitive array of Greenfield's pioneering work and encompasses incomparable images of the precision and power of the human body. For this traveling exhibition, the images are collected into series that together transcend any one fixed single image. Each gallery becomes a resonant field of forms and figures, phrases and rhymes, and themes and configurations, forming, shifting structures of concept and design. This presentation of Greenfield’s oeuvre brings a fresh perspective and new interpretation to her classic Black and White work. 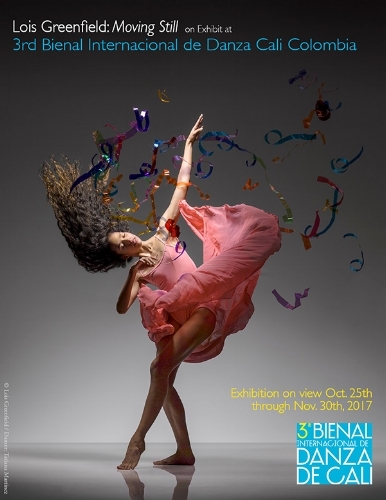 “Dancing on Paper” is Lois Greenfield’s first exhibit dedicated to the work of a single choreographer. It celebrates her long-time collaboration with Eliot Feld and his dance company Ballet Tech. Many of the twenty-six photographs on view at the Huashan Creative Park, feature recent images of Wu-Kang Chen, who first joined Ballet Tech in 2001 and then co-founded the first all-male Taiwanese dance company HORSE in 2005. This series sets the lithe and graceful form of the dancers in an unexpected narrative. The dancers, as seen through Lois’ lens, seem to take on angelic or demonic identity, either flying through the heavens or plunged into the underworld. These poetic figures reveal themselves as creatures playing out a mythic and eternal drama. Preferring to work with dancers on improvised, non-repeatable, often high-risk movements, Greenfield’s images yield unique experiences not as excerpts of theatrical choreography, but as individually Imagined Moments. Included in this exhibition are; Euclid’s Dream – a revolving plexiglass cube that emphasizes Greenfield’s spontaneous and dreamlike vision, and Resonant Intervals – a 64-panel composition of calligraphic images of dancers.